The last few years have seen a substantial change on the way media is produced, distributed, and consumed. 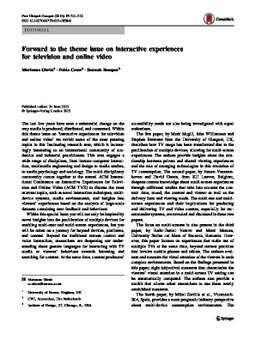 Within this theme issue on ‘interactive experiences for television and online video’ we revisit some of the most pressing topics in this fascinating research area, which is increasingly interesting to an international community of academics and industrial practitioners. This area engages a wide range of disciplines, from human–computer interaction, multimedia engineering and design to media studies, to media psychology and sociology. The multi-disciplinary community comes together at the annual ACM International Conference on Interactive Experiences for Television and Online Video (ACM TVX) to discuss the most relevant topics, such as novel interaction techniques, multi-device systems, media environments, and insights into viewers’ experiences based on the analysis of large-scale datasets containing user feedback and behaviour. Within this special issue you will not only be inspired by novel insights into the proliferation of multiple devices for enabling multi-user and multi-screen experiences, but you will be taken on a journey far beyond devices, platforms, and content. Beyond the traditional remote control and voice interaction, researchers are deepening our under- standing about gesture languages for interacting with TV media or viewers’ behaviour towards browsing and searching for content. At the same time, content producers’ accessibility needs are also being investigated with equal enthusiasm. Obrist, M, Cesar Garcia, P.S, & Basapur, S. (2015). Interactive Experiences for Television and Online Video. Personal and Ubiquitous Computing, 19(5-6), 741–742.